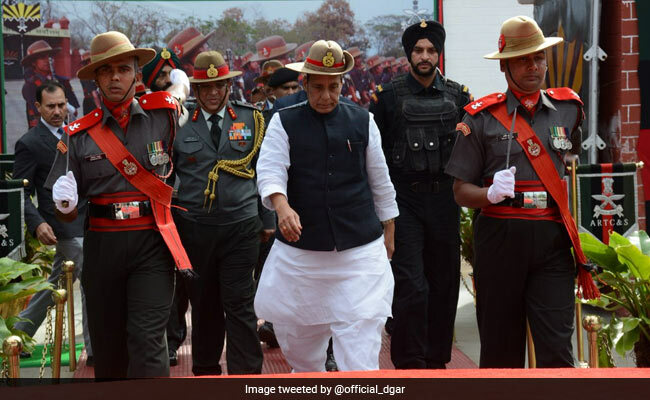 Rajnath Singh said the the Assam Rifles has been carrying out an exemplary dual service of guarding the porous 1,642-km long Indo-Myanmar border and counter insurgency operations. Rajnath Singh also highlighted the difficult task of Assam Rifles of guarding an "open border". Shokhuvi, Nagaland: About 75-80 per cent insurgency problems in the northeast has come to an end, Union Home Minister Rajnath Singh said today. At a 'Sainik Sammelan' at the Assam Rifles Training Centre in Nagaland, he said the country's oldest paramilitary force has been carrying out an exemplary dual service of guarding the porous 1,642-km long Indo-Myanmar border and counter insurgency operations. "I can tell you that 75 to 80 per cent of the insurgency problems in the northeast has come to an end," he said. Mr Singh also highlighted the difficult task of Assam Rifles of guarding an "open border", where a free movement regime is also in place for uninterrupted travel to each other's territories by people of both the countries. "It is a difficult task for you as Myanmar is a friendly country. You have to take care of the diplomatic sensitivity so that our relations do not hamper," he said.